John and Robyn Cooney are unrepentant baby-boomers – born shortly after the war and emerging naked, without their reading glasses. They grew up on the foggy streets of Hamilton ... John achieving absolutely nothing at Boys High School (aside from being the shortest kid in the third form) ... and Robyn achieving little more at Technical College (aside from winning a book for something she can't remember in the fifth form). Several uneventful years later, they met in Woolworths on their respective office lunch-breaks: he, a cute little guy with short-back-and-sides … she, an angel in stiletto heels. And, three short years later, he knelt in the grass beside the Hamilton Lake and begged for her hand in marriage. She, thankfully, said yes. And the rest (as they say) is history. John and Robyn are currently the proud parents of three overgrown adult kids … the adored parents-in-law of three outlaws ... and the penniless spoilers of 12 exceptional grandkids and three gorgeous great-grandkids. In 1981 the Cooneys and their colleagues launched GRAPEVINE MAGAZINE – to “give families a lift” ... and improve (at least in some small way) the quality of home-life in New Zealand. And the rest (as they already said) is history. Today, John continues in his role as Grapevine’s Big Cheese ... and Robyn as Chief Censor. John (with Robyn's assistance) has spoken over the years at a zillion family-related seminars and events (well, quite a few) … and has been a sometimes radio personality on NewstalkZB. 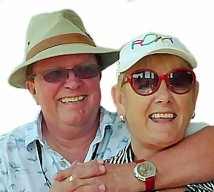 John and Robyn have, in their own words, enjoyed a charmed life. They’ve recently become gypsies, trading the house they owned for 30 years for a spacious new MOTORHOME, with the intention of seeing all they can of this beautiful country “while they’re still young”. And as a hobby (in their spare time, after lunch), they lead Kiwi tour groups on ‘MIDLIFE MADNESS’ adventures to all sorts of exotic destinations.